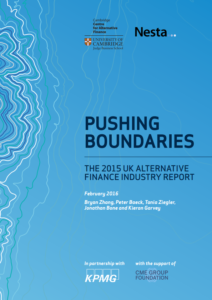 Pushing Boundaries – the 2015 UK Alternative Finance Industry is the latest report jointly published by the Cambridge Centre for Alternative Finance at the University of Cambridge and Nesta, which tracks the size and development of online alternative finance in the UK. In total 94 companies participated in the survey and the results give an in depth understanding of the marketplace lending industry in the UK. As it continues to be the market that leads the way, reading this report is definitely well worth the while. A total of 1,09 million people invested, donated or lent via online alternative finance platforms in the UK. The market saw increased involvement from institutional investors – 35% of all the P2P consumer loans in 2015 were funded by institutions. UK marketplace lenders funded a total of £3,2 billion, up from £1,74 billion in 2014. The industry is satisfied with current regulation – 91% of surveyed platforms stated that they regard the current regulation as “adequate and appropriate”. 98% of lenders used the automated bidding functions – as with most of peer-to-peer consumer lenders it is a common practice to offer almost exclusive auto-bid features for lenders in order to improve market inefficiencies and reduce credit risk through diversification. Peer-to-peer consumer lending reached £909 million in 2015, compared with £547 million in 2014. Mentioned risks affecting future growth of the alternative finance sector were collapse of platform(s), cyber security and increase in default rates.